Above: This wonderful etching of Buxton’s Pavilion Gardens appears as the frontispiece in Strephon’s ‘Pilgrimages in the Peak’, first published in 1879. Click the image at the bottom of the page to view the complete illustration. 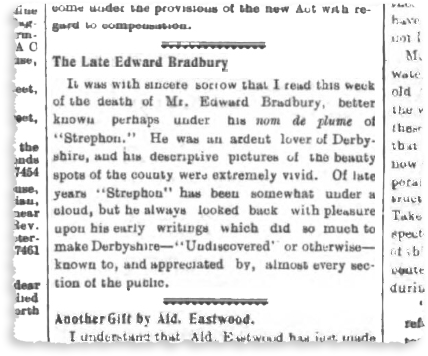 Above: Strephon’s obituary in the 11th March 1905 edition of the Derbyshire Courier (click to enlarge) reports that; ‘Of late years, “Strephon” has been somewhat under a cloud’. It would be interesting to know what he had done to create such a cloud. But I doubt we’ll ever know! I’ve now posted four of Strephon’s articles about his travels in the Goyt Valley (see links below). The style is very florid (I can’t think of a better word!) and a bit of an acquired taste, but I really enjoy reading them. And from feedback I’ve had, other readers share my enthusiasm. Strephon was the pen name of Edward Bradbury, who is usually regarded as a typical Victorian journalist and very much of the dilettante set. He was born in December 1853 in Derby, the son of master tailor John Bradbury and his wife Harriett. After leaving school he entered the service of the Midland Railway, where he enjoyed privileged facilities, and devoted his leisure hours to writing articles for the local press under the pseudonym Strephon, often on railway-related subjects. These articles were published in the Derbyshire Times and the Sheffield Daily Telegraph. Certain sketches were also published nationally in London Society, Cassell’s Magazine and The Magazine of Art, while many appeared later in book compilations, often in an expanded format. By 1891 he had moved to Buxton and was living at 1 Hartington Terrace, West Street – advertising himself in the Directories as Edward Strephon Bradbury. Above: The is the entire scan of the etching at the top of the page showing Buxton’s Pavilion Gardens (click to enlarge). It’s taken from the fold-out frontispiece of Strephon’s ‘Pilgrimages in the Peak’, first published in 1879. 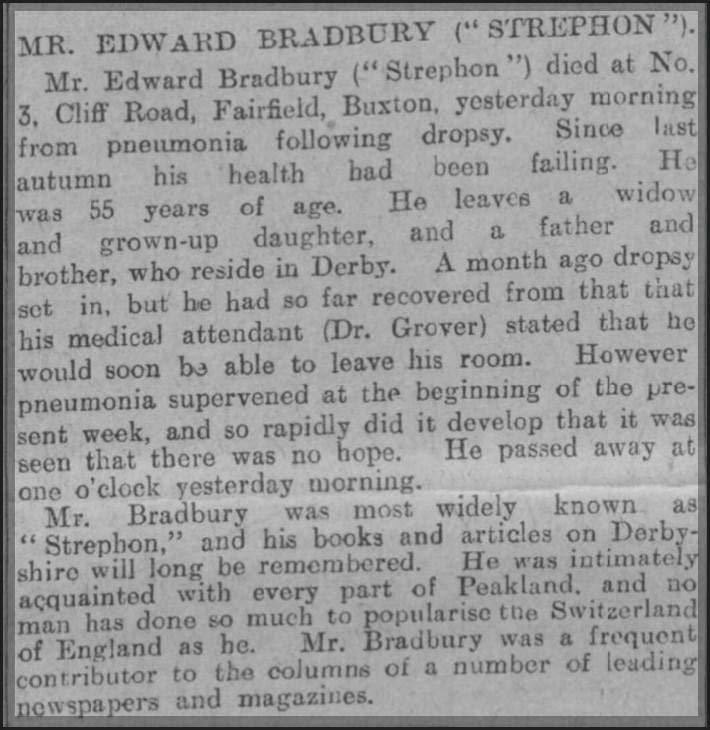 Page update: We’ve found another obituary of Strephon which appeared in the Sheffield Daily Telegraph on 4th March 1905 (click to enlarge). The cause of death was given as ‘pneumonia following dropsy’.